The magic begins the moment you arrive at Florence’ airport or railway station, when you are met by your driver for your private transfer to the Villa San Michele. Nestled on a hilltop surrounded by trees and terraced gardens, it overlooks the city of Florence, spread out before you like a sepia-toned Renaissance map. Eleanor and I succumbed. Avid gardeners, we spent our first day walking the Villa’s gardens, filled with lemon trees and roses. We swam in the heated pool, perched above the building. That evening, we dined alfresco in the loggia on the superb Tuscan cuisine, as we watched the Duomo catch the last of the sun’s rays. The next day is reserved for sight-seeing. If you’re like us, you’ll take full advantage, perhaps visiting on your own the more well-known sights: the Uffizi Gallery, the Accademia Gallery, the Boboli Gardens, then letting your private guide drive you further afield to some of Florence’ more exclusive attractions. You repeat this gentle schedule in Venice, following your first-class transfer via Trenitalia ETR 600 high-speed train. This time it’s the Cipriani, whose overwhelming delights keep you from leaving-even with “The Most Serene Republic of Venice” beckoning. Following a warm greeting from the front desk-we’d arrived at midday-we were escorted to a waterside table for an alfresco lunch, preceded by sparkling, cold Bellinis-peach nectar mixed with champagne-one of the Cipriani’s signature drinks. The two balconies of our deluxe two-room suite overlooked the lagoon-perfect for room-service breakfasts. Inside, the Moorish-themed décor featured incredible silk and glass Fortuny lamps, pale green Moorish trim on the walls and delicate Venetian mirrors. Dining at the Cipriani is reason enough to travel to Venice. Our first night we ate at the Cip’s Club, a floating restaurant built on pontoons. The sky turned rose over the Grand Canal, as boats glided past and candlelight danced on the tables. Meanwhile, if you can tear yourself away from the restaurants, check out the Cipriani’s swimming pool, the largest in Venice. We began our day with touring – water taxi to Murano, a visit up the bell tower, a lovely afternoon dancing, listening to music and enjoying a light lunch at the Café Florian on San Marcos Square. The experience was delightful but intense, what with the hordes of tourists, especially when a cruise ship docked. What to do? Directly opposite San Marcos’ Square, we boarded the hotel’s free shuttle, a classic wooden speedboat, back to the Cipriani. Travel time was all of 10 minutes (the service is available around the clock and departs every 10 minutes.). For more information on how you can take your own “Romantic Italian Holiday,” click here. To read a short account of our Orient-Express trip, please click here. To see a photo gallery of our Orient-Express adventure, click here. South Africa’s new “Gautrain” is fast, clean, comfortable and on time. That’s what I learned following my test run of the service a few weeks ago, just prior to joining IRT’s Cape Town – Dar es Salaam Rovos Rail tour. My trip was from Johannesburg O.R. Tambo Airport to shopping and tourist mecca Sandton City. It’s easy to buy a Gautrain ticket. And once aboard, I found Gautrain staff to be friendly and helpful. Security – always a concern in South Africa – was reassuringly visible, both inside the trains and at the stations. Gautrain opened its doors in June 2010, just in time for the South Africa-hosted FIFA World Cup. The Gautrain’s 12.5-mile route is largely underground and on viaducts. It reaches speeds of up to 100 mph. The Bombardier-designed passenger cars are sleek and comfortable. The project has not been without controversy, however. The system cost a whopping $4 billion to build; my one-way ticket, at about $18, is far out of the price range of most locals. Also, the train was built to the North American standard gauge – 4’8 ½”, which is incompatible with South Africa’s 3’6” Cape Gauge. That restricts the possibilities for expansion, although Cape Gauge service from the airport to Pretoria just opened. For me, however, the Gautrain was ideal. The service was a welcome alternative for air travelers who wish to avoid pricey and time-consuming taxi rides to Sandton City. And any rail fan would enjoy the ride. “This September’s German high-speed rail tour includes factory tours, the main station in Berlin and the airport station in Frankfurt,” said Rick Harnish today in an email. Harnish is executive director of the Midwest High Speed Rail Association and will lead the High Speed Germany journey September 17 – 24, 2011. “We will ride both Siemens’ 220 mph ICE-3 and their 150 mph RailJet. We even managed to fit in a sleeper train [first-class German Rail City Night Line service Berlin-Munich]. This is billed as a behind-the-scenes technical tour, but no one will mind if spouses wander away to shop, visit museums, ride trams or simply sit in cafés and watch the world go by. Last year, we were honored to develop the journey High Speed France: An exploration of High-Speed Rail, Stations and Intermodal Transit. Participants gave the journey the highest ratings, returning to the US quite excited in their advocacy for rail. See this link to a great slide show about last year’s journey. This year’s trip will be just as exciting. Let us know if you want to join dynamic tour leader Rick Harnish on High Speed Germany. Don’t you wish you could hop aboard? 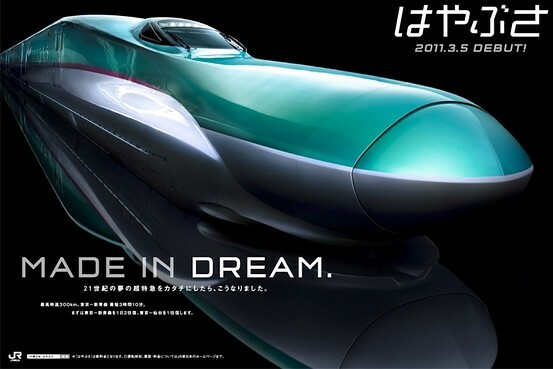 JR ad for the new Shinkansen 'Hayabusa' trains running on the high-speed Tokyo-Aomori route. Japan’s new class of “Hayabusa” trains on the high-speed Tohoku shinkansen route between Tokyo and Aomori feature, according to the Wall Street Journal’s JapanRealTime, a luxury 18-seat ” GranClass” car. Says the WSJ: they are “reminiscent of business-class air travel, with plush leather seats that recline by up to 45 degrees, as well as…a dedicated cabin attendant. Not the Eastern & Oriental Express, but a welcome addition to upscale, high-speed rail travel. What a great start to the new year –– a focus on trains in the national media. National Public Radio’s popular Diane Rehm show today features a wide-ranging discussion about U.S. President Obama’s $8 billion high-speed rail initiative. Among her guests are Roy Kienitz, Under Secretary for Policy at the U.S. Department of Transportation, as well as representatives from the Brookings Institution and the Association of American Railroads. Listen to the program: High Speed Rail in the U.S. Meanwhile, the Midwest High Speed Rail Association plans to quantify the impact of 220-mph trains on the U.S. economy. “We will need to quickly complete the project and publish its results to influence the coming debate,” says Rick Harnish, executive director. Help fund the MHSRA project by clicking here. I’d love to hear your thoughts about this important issue. Some of our members think high-speed passenger service is basically a boondoggle. Others think it’s essential infrastructure for our nation. What are your thoughts?